Millions — if not billions — of men around the world wonder what women really want. For all the lady lovers out there, I’m here to let you in on the secret. Sometimes, all women want is just a delicious bowl of ice cream. Especially when it’s a heaping scoop of banana ice cream with chocolatey peanut sauce. This recipe was inspired by two of my favorite people: my Grandma and my Dad. My grandma loves ice cream. I’ll make a bold claim: she loves it more than anyone in the whole world. It’s inevitable that whenever I visit my grandma, she’ll make her way to the kitchen at some point for ice cream. Over the past decade she has developed Alzheimers and though she remembers that she has a desert stomach specifically designated for ice cream consumption, she (bless her heart) forgets how many bowls she has eaten in one sitting. My dad also loves ice cream, but he stands out in my mind more for his faithful love of peanut butter. He, on the other hand, is sharp as a tack and claims that peanuts are a superfood. Especially when said peanuts are in the form of crunchy peanut butter atop crackers. It’s been his staple snack for years. I can’t blame him, peanut butter on anything, in my book, is delectable. I was thinking of them both today, so in honor of their great taste I made a batch of raw vegan banana ice cream topped with a chocolatey peanut sauce. It is simple to make and down right delicious! Cut the frozen bananas into smaller chunks so that the food processor has an easier time blending them. Add the 1/4 cup of coconut oil and process together until they reach the consistency of soft serve ice cream. If you don’t mind your ice cream soft serve, then you’re to add the chocolatey peanut syrup. However, if you want the ice cream to firm up a bit, place the ice cream in the freezer in a shallow glass dish for half an hour before serving. Now for the chocolate sauce. By the way, those two words — “chocolate sauce” — may just be my favorite combination of two words in the English language. 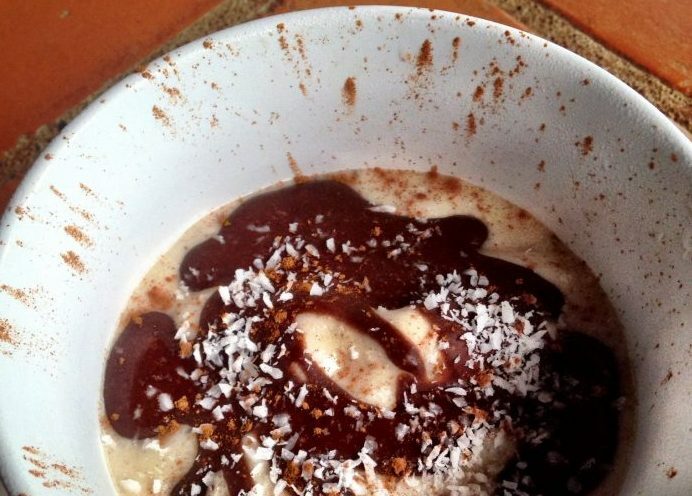 In a bowl, stir together the peanut butter, cacao powder, honey, and coconut oil. You can either eat the ice cream immediately or put it in the freezer for a minute so that the chocolate sauce turns into chocolate shell. Regardless of which you choose, your tastebuds will be singing with sweet ice cream symphonies! Servings: Two heaping bowls of ice cream if you’re like me and my grandma! But if you have a decent amount of self control, this recipe makes enough for four adequately portioned bowls of ice cream to share amongst friends. Sprinkle your serving with dried coconut flakes and cinnamon. And hey, this may seem like a decadent recipe. Guess what? It is! Ice cream is supposed to be a treat. It is inherent in it’s creamy, delicious nature, even when it’s made from pure, whole foods. So enjoy it! And if your grandma is around, scoop some out for her. It’s a scientifically proven fact that 99% of grandmas will appreciate an unasked-for bowl of ice cream. We both started giggling, because you know what? We knew she just may be right.